To report an adult sea turtle or hatchling on Ocean Isle Beach, please contact us immediately by calling our on call volunteer or the Ocean Isle Beach Police. Please only call these numbers for sea turtle emergencies. We would like to have as much information as possible: location of turtle on the beach and status of turtle (live, injured, dead). 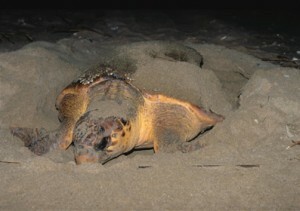 Do not attempt to touch or move the sea turtle as any injuries it may have could be aggravated. Please do not shine flashlights or take flash photographs on or near a turtle or hatchling These lights will frighten and can cause harm to the sea turtles eyes. 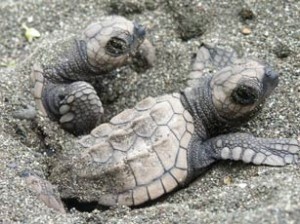 During summer months, the turtle may be a nesting female. Stay with the turtle, if possible, until someone from the OIB Sea Turtle Protection Organization arrives. My daughter is interested in the internship program this summer. She is a freshman in high school and has worked as a junior volunteer at the Museum of Coastal Carolina. I see the question about a sponsor; are you asking for a current volunteer to act as sponsor? We know several if needed. When did the window to adopt a turtle open for 2019 ? I adopted nest in the past and was interested in doing it again. Hey Marsha- Nest sponsorships for 2019 are currently closed. However, we are working on a new sponsorship “Lights Out! Sea Turtles Dig the Dark” The will be a nest sponsor sign at each nest and a Light’s Out, Sea Turtles Dig the Dark sign. Like the nest sponsor sign, each Light’s Out sign will include the sponsor name. Proceeds from these signs will be designated to purchase sea turtle approved light fixtures, light bulbs and other products that will reduce artificial lights on OIB. As soon as we have finalized the new program, I will email interested sponsors. Please let me know if you’re interested. Hi, I would like info m your Lights Out sponsorship also. How can one get on the 2020 nest sponsorship list as a gift for my parents?